Hansa Elephant Mouse Plush Animal Toy, 6"
For sale is a 2000 Hansa standing grizzly bear that's 21" tall approx. A super clean estate find for your collection! They are light golden yellow with black spots all over their body. Top quality stuffed animals by Hansa. Four beautful Hansa Cheetahs. Cheetah standing is 13". Hansa Baby Cheetah Cub Thomas Boland & Co Plush Stuffed Toy.EUC with no Noticeable Flaws.has wire in front paws for posing. The Hansa Creation hand-crafted collection of realistic plush animals s created by artists working in a socially and environmentally responsible studio, and create each Hansa animal from portraits of the creature in its natural habitat. The perfect gift for a family member, friend or even yourself! Lovely and soft to touch and cuddle! Age Group: The Recommended age for Hansa animals is 3 and up to comply with ASTM93 safety standards. Portraits in Nature is a hand-crafted collection of realistic plush animals. Artists working in a socially responsible and environmentally responsible studio create each Hansa animal from portraits of the creature in its natural habitat. The Hansa Story Artisan hand sew the animals inside out, an old world tradition that results in the mininization of se. Hansa tiger. Size: 40 cm. Airbrush details on face and body. Best price. Age: 3 years & up. Quick delivey. Hansa Mammoth. Size: 40 cm. Can be machine washed at 30° C. Age: 3 years & up. Plush tusks. Airbrush details on face. On average, there are 42 separate pieces required to make each animal, that must be combined by a team of truly creative artists to create the distinctly realistic features that characterize HANSA animals. Makes a HANSA CREATIONS gift so special! This is why HANSA CREATIONS appeals to collectors and animal. Beaver Upright Stuffed Animal by Hansa Hand Made 3 Boys & Girls. quantities to Hansa's exacting specifications. Hello and thanks for looking. Up for sale is a Hansa Creation Portraits of Nature Plush Stuffed Toy Monkey. #1115 NO RIPS OR TEARS ON IT. COMES FROM SMOKE FREE/PET FREE HOME. Please view pictures for more details. What you see in pictures is what you get. If you have any questions about the item I will have an answer for you within 24 hours. The Hansa Creation hand-crafted collection of realistic plush animals s created by artists working in a socially and environmentally responsible studio, and create each Hansa animal from portraits of the creature in its natural habitat. The perfect gift for a family member, friend or even yourself! Lovely and soft to touch and cuddle! Product Specifications: Details - Hyacinth Macaw 50cm L Condition - Brand new Size - 50cm L Brand Hansa Item Width 0.150m Item Length 0.500m Item Height 0.210m. The Hansa Creation hand-crafted collection of realistic plush animals s created by artists working in a socially and environmentally responsible studio, and create each Hansa animal from portraits of the creature in its natural habitat. The perfect gift for a family member, friend or even yourself! Lovely and soft to touch and cuddle! Product Specifications: Details - Feather Tail Glider 22cm L Condition - Brand new Size - 22cm L Brand Hansa Item Width 0.080m Item Length 0.220m Item Height 0.030m. The Hansa Creation hand-crafted collection of realistic plush animals s created by artists working in a socially and environmentally responsible studio, and create each Hansa animal from portraits of the creature in its natural habitat. The perfect gift for a family member, friend or even yourself! Lovely and soft to touch and cuddle! Product Specifications: Details - Cassowary Baby 16cm H Condition - Brand new Size - 16cm Brand Hansa Item Width 0.080m Item Length 0.140m Item Height 0.160m. THE HANSA STANDING OTTER IS 13 1/2" TALL. THIS HANSA REALISTIC STANDING OTTER LOOKS RELISTIC AND IS VERY CUTE AND WOULD MAKE A GREAT ADDITION TO ANYONE'S COLLECTION. 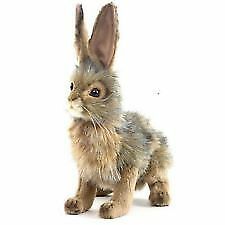 HANSA Cute Donkey Lifelike Great Quality Stuffed Animal Aprox 18" long. This HANSA Cute Donkey Lifelike Great Quality Stuffed Animal Aprox 18" long is in great condition and clean. The Hansa Creation hand-crafted collection of realistic plush animals s created by artists working in a socially and environmentally responsible studio, and create each Hansa animal from portraits of the creature in its natural habitat. The perfect gift for a family member, friend or even yourself! Lovely and soft to touch and cuddle! Age Group: The Recommended age for Hansa animals is 3 and up to comply with ASTM93 safety standards. Portraits in Nature is a hand-crafted collection of realistic plush animals. Artists working in a socially responsible and environmentally responsible studio create each Hansa animal from portraits of the creature in its natural habitat. The Hansa Story Artisan hand sew the animals inside out, an old world tradition that results in the mininization. Since each animal is hand-sewn, there will be slight variations in appearance. Age - 3 and up. Age Group: The Recommended age for Hansa animals is 3 and up to comply with ASTM93 safety standards. Portraits in Nature is a hand-crafted collection of realistic plush animals. Artists working in a socially responsible and environmentally responsible studio create each Hansa animal from portraits of the creature in its natural habitat. The Hansa Story Artisan hand sew the animals inside out, an old world tradition that results in the mininization of seams, and their bodies are carefully sculpted to create musculature and features like movement in a walking or sitting position that are unique to each creature. On average, there are 42 separate pieces required to make each animal, that must be combined by a team of truly creative artists to create the distinctly realistic features that. 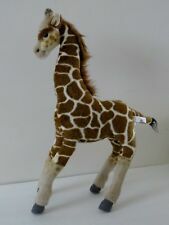 Hansa Toys is known and respected for their close-to-nature reproductions of the world’s best loved animals. Hansa Plush Bear. 24” standing Grizzly brown bear. Like new condition soft and clean. The Hansa Creation hand-crafted collection of realistic plush animals s created by artists working in a socially and environmentally responsible studio, and create each Hansa animal from portraits of the creature in its natural habitat. The perfect gift for a family member, friend or even yourself! Lovely and soft to touch and cuddle! Product Specifications: Details - Cygnet Swan 20cm Condition - Brand new Size - 20Cm H Brand Hansa Item Width 0.100m Item Length 0.200m Item Height 0.160m. Hand Painted Airbrush Detailing. Large Rabbit. on our bears & animals as we like to leave them. All of our bears are heavily researched for hours by our staff. in the original condition for our collectors. Hansa Ringtail 16". Hansa is a hand-crafted collection of realistic plush animals. Hansa animals appeal to collectors and animal lovers of all ages. These nomadic reindeer herders bred the fluffy white dogs to help with the herding, and to pull sleds when they moved. Portraits in Nature is a hand-crafted collection of realistic plush animals. On average, there are 42 separate pieces required to make each animal, that must be combined by a team of truly creative artists to create the distinctly realistic features that characterize HANSA animals. Nicely Detailed Elephant Mouse by Hansa Toys. Elephant Mouse stands upright. The charming and realisticly modeled toy Hansa Cat will bring joy and fun while playing games. The toy is very similar to its living prototype. During the game, parents can tell the child a lot of interesting things about animals, and the child will probably remember all this, because the information will be provided in a playful way. Excellent workmanship makes this toy a wonderful gift for any holiday. Hansa toys are sewn and hand-crafted, which allows for maximum realism of the image. 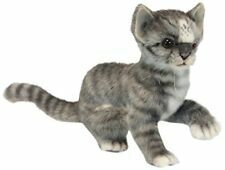 The toy is made of high quality faux fur, the eyes are made of plastic. With the help of Hansa toys, you can create various interior images in children's, studios and living corners. The Hansa Creation hand-crafted collection of realistic plush animals s created by artists working in a socially and envir. Hansa black and white cat. Size: 40 cm. Can be machine washed at 30° C. With information leaflet. Age: 3 years & up. Safety nose. HIGH QUALITY PLUSH HANSA STUFFED TOY OWL w/ TURNING HEAD 18" VERY CUTE!